Review: A Russian silent movie which depicts the city of Moscow from sunrise to sunset. One of the earliest films ever made. This is regarded as one of the top ten official critics classic films. Others that are in the list are Citizen Kane (1941), 2001; A Space Odyssey (1968), The Searchers (1956), and also Tokyo Story (1953). These films were all well received by audiences around the world. They weren’t just hailed as master-pieces by stuck-up critics. There is a long scene in this where the director juxtaposes numerous close-ups of hands, for example sharpening an axe, sewing, editing film at a phone operator’s patch board, wrapping cigarettes at a cigarette factory and also playing a piano. It is an impression of the community of manual labour and the sense that the hands of all its workers will build the new Soviet society. This is a remarkable panorama of Moscow life showing the workers, shoppers, holiday makers, the machines that keep the city moving and so on. 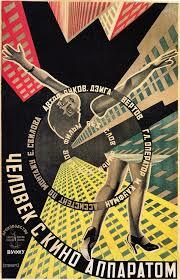 Born Denis Kaufman, Vertov took his name from the Ukrainian words meaning spinning, turning or, more appropriately, revolution. This is a film that introduced audiences to all sorts of new camera techniques, for example double exposure, fast motion, slow motion, freeze frames, jump cuts, split screens, Dutch angles, extreme close-ups, tracking shots, backwards footage, and stop motion animation. The film was actually shot in Moscow, Odessa, Khakiv, and Kiev, the latter three now being in the Ukraine. All of the cinematography was done by his brother, Mikhail Kaufman, who refused to ever work with him again.